This event has reached the maximum participant capacity, we apologize to those who will not be able to join us this time. Through the use of meaningful quotes and blankets that represent part of Turtle Island (the Western Hemisphere), we explore this shared history that non-native people rarely learn in school or other settings. The Exercise helps participants deepen their understanding about the European colonization of Turtle Island and the denial of Indigenous peoples’ nationhood throughout U.S. history up to present time. After the Witness to Injustice / KAIROS Blanket Exercise, participants have the opportunity to share with the group what they learned, felt, etc, and resources are shared by facilitators to help participants continue to learn more. 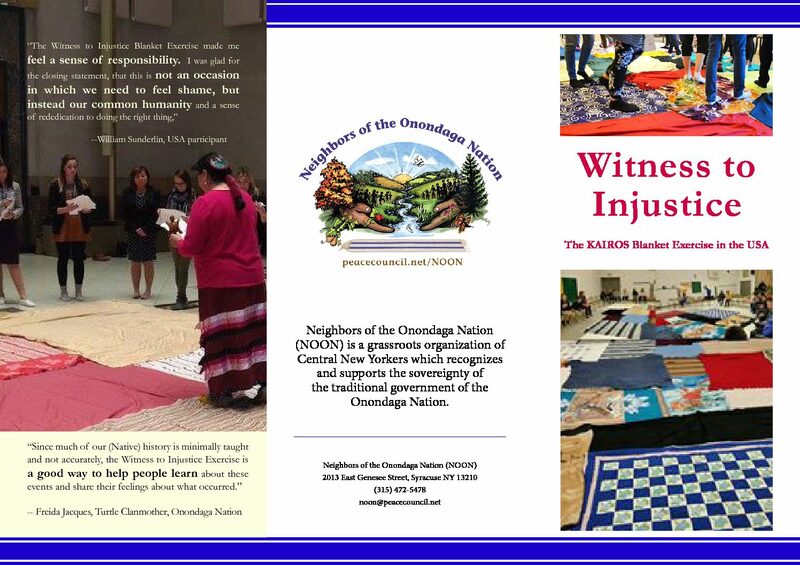 Join facilitators from Neighbors of the Onondaga Nation (NOON), and the Gandhi Institute as we participate in learning and dialogue through this exercise. ***NOTE: The event location has changed. The correct location is listed at the top of this page.